Here are some of the soft skills IT pros must have for offering successful business advice. At the start of each year, a series of buzzwords are unleashed onto the IT industry, and for the next 12 months, these buzzwords dominate all industry conversation. But activating technology—regardless of whether it’s a new and shiny technology like AI, or an older, and slightly less fancy technology—isn’t a case of just ‘plugging it in.’ It requires a knowledge of current capabilities, technical complexities, and the ability to anticipate deployment challenges. Even when demand for such technology comes from the top down, it’s the IT professional that is ultimately responsible for providing clarity and guidance around these technologies. But management and labour are not always of the same opinion when it comes to whether or not this new technology should be deployed. Furthermore, providing business leadership and helping to inform boardroom priorities requires an entirely different set of skills than those required for the day-to-day job of an IT professional. IT pros must bridge this gap and provide useful and valuable business advice. The recent SolarWinds IT Trends Report 2018 highlights a number of discrepancies between the views of the IT professional and their senior managers on where priorities in IT investment should lie over the next three to five years. Enterprises, for example, see AI and machine learning (81 per cent), and process automation and robotics (82 per cent), as important C-suite directives toward operations strategy—higher than any priority other than cost reduction. But IT professionals aren’t of the same mind, and when ranking technologies required for an organisation’s digital transformation, AI didn’t even make the top five. With the excitement around technologies such as machine learning and AI set to continue into the foreseeable future, what does this mean for the IT professional? Executives want to see the benefits of these technologies, with little care as to how these technologies are implemented. Regardless of their attitudes, IT pros must have a fundamental understanding of these technologies and their capabilities—even if they don’t believe they are important to business transformation in the future. But while this may seem like a burden, there is an opportunity here for the IT professional. By becoming an educator, IT pros can identify ways to discuss the basics, highlight the specific cost-benefit analysis of how the technology will (or will not) benefit the business, and what it ultimately means for service integration and service delivery. Looking outside of the organisation allows IT pros to understand the applications of new technologies—and by using real world examples, make it easier for executives to understand. Furthermore, contextualising emerging technologies and illustrating how they solve a current business problem within the organisation will help ensure a new technology is implemented because it is beneficial to the company, not because it makes the company look like an innovator. AWS Deep Lens and Microsoft Azure Deep Learning are perfect examples. These toolsets not only highlight real-world use cases for deep learning, they also show how to apply them to the business beyond IT operations. To help ensure a new technology achieves digital transformation success, IT professionals should embrace the resiliency and reliability of their environments as critical performance metrics. Resiliency and reliability underscore the business value that IT professionals can bring to fruition for their organisations. They also represent measures of how well a distributed application was integrated and delivered—and because they represent overall performance, these metrics translate into dollar values. While resiliency should be used to ensure an acceptable level of service in the face of faults and challenges to normal operation, reliability should be used to measure how a system recovers from infrastructure or service disruptions, and ensure service disruptions, including misconfigurations, are mitigated. Amazon®, for example, has calculated that a page load slowdown of just one second could cost its business $2 million in sales each minute. The average small business can expect to lose approximately $100,000 in IT downtime every year. With the stakes so high, the ability to ensure a positive digital experience for the end-user is essential. By using the environment as a measure, IT pros can observe and trace data that underpins reliability and resiliency metrics, and ultimately optimises environments. 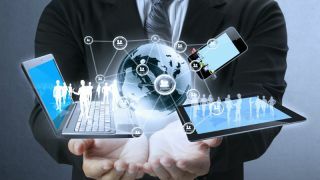 Simplifying technology and making it easy for executives to understand is another important skill that IT pros should adopt. If IT pros can cut through the jargon and overwhelming complexity, they will be seen as masters of identifying a solution’s strengths, and executives will fully appreciate their advice when it comes to saying whether a new technology is, or is not, perfect for an organisation. To do this, IT pros will need to shift the focus away from product features, and onto IT issues. Not only does this mean executives can understand how the technology will meet business needs, but shifting the focus towards IT issues means IT can set expectations around delivery and resource needs. While executives may see a new technology, believe the hype, and want to implement it right away, they won’t want to do this if they know it doesn’t provide any real business value. As previously mentioned, there is little point implementing technology just to be labelled an innovator—and executives will more often than not want to understand the impact a new technology has on the bottom line. IT pros should therefore ensure they emphasise the value new technology brings, while balancing the cost of investment with the time and effort included in the overall cost. This will highlight the true value and allow executives to see through the marketing hype. While it may be outside the comfort zone, becoming a vocal champion within the organisation will only further highlight an IT professional’s capabilities, knowledge, and expertise. IT professionals have the foundation—they understand the technology inside and out, know when it should and shouldn’t be applied, and understand how it can be deployed. By delivering a persuasive argument and lobbying for the ‘right’ causes, IT professionals can ensure that executives know what they're capable of and can learn from their conclusions. While there can be a dissonance between the business leaders charged with setting a company’s vision, and the IT professionals tasked with executing that vision, this dissonance can often provide an opportunity for IT pros. IT professionals have the tools to provide valuable business leadership—they just need to ensure they are showcasing their knowledge, understanding, and expertise. By doing so, not only will they ensure new technology is implemented for the right reasons, they will be truly valuable advisors to senior managers.